More nail polish from Urban Decay! This summer's mini nail set, Showboat, is mostly neon with a shimmery jewel-tone and a black creme thrown in for contrast. Every shade is bold, eye-catching and very appropriate for summer. 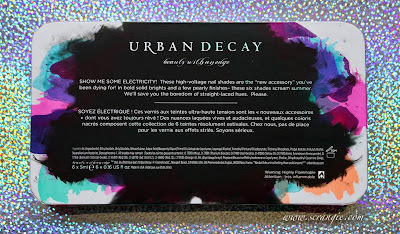 Urban Decay Radium. Radium is a medium blue shimmer. This is little more smooth glowy than the average shimmer because it has a slight metallic finish, but it's not quite approaching chrome territory yet. Urban Decay Covet. This one is a bright teal with subtle silver and green shimmer. This is one of those nearly-neon teals that I can never seem to photograph accurately. In real life it's more green-colored than it appears here and a bit more saturated. It dries matte like a neon. Urban Decay Perversion. Standard black creme. Good pigmentation, but it needs two coats for full coverage. Urban Decay Fishnet. A neon purple creme. Like most neon purples, it's not completely purple, but rather a deep yet fluorescent fuchsia. This one is very vivid and my picture does it no justice at all. To give you an idea of the true color, it's somewhere in between Essie Perky Purple and Illamasqua Stance. Urban Decay Woodstock. This one has been in two previous nail kits (Rollergirl and Summer of Love). It is a neon pink creme and it is extremely bright. Urban Decay Showboat. This one's a neon orange and, like Woodstock, it's extremely bright. It kinda hurts my eyes to look at it, it's so bright. Awesome. The formula on these was great. It is a definite improvement over the previous sets. It's less thick, more pigmented and has a much better texture and application. I had no trouble whatsoever with the application of any of these colors, the formula on all of them was perfect. I did three coats of each, but only Woodstock and Showboat actually needed the third. Dry time is very fast. The neons dry to a matte finish like all neons do, so you will need to use topcoat if you want them to look shiny (I used topcoat). This set might be best for someone who doesn't own much nail polish; someone with even a modestly-sized collection may likely already own dupes for almost every color. The only one in here that I can't think of a match for is Covet, though it is somewhat similar to Zoya Zuza. Duplicate shade issues aside, the colors are all insanely pretty and the formula is great, not a single bad one in the bunch in terms of formula or color. 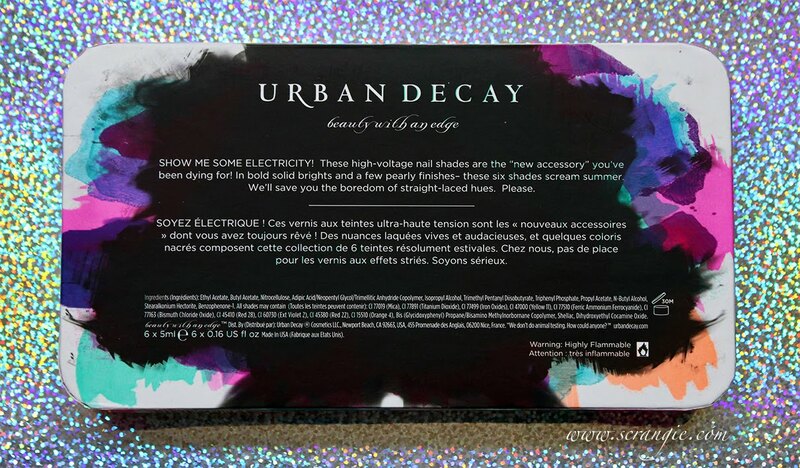 The Urban Decay Showboat Nail Kit retails for $28 and is now available on urbandecay.com. Awesome swatches! I just saw this on the UD website and am thinking about getting it, just for Showboat. Gorgeous color. Would look great on some toes! Ooh yeah, excellent pedicure color for sure! UD always is on point with their colors. I only have one neon pink. Looking forward to picking these up. Do you know how Covet would compare with something like Barielle Decadence? I'm not a huge fan of neons, but I love the selection and variety in this set. Makes me regret that I just recently put gel nails on! I love the neon orange, and I like all of them! The shimmery blue isn't my favorite though, it's a little frosty in a dated way. These all look so amazing! Perfect for summer! I love the pink and orange! Love Fishnet and Woodstock - love the vibrancy and super shiny. They are even nicer in real life- SO BRIGHT!! Love these! I've never tried UD polishes....thanks to you, now I must! I think you'll be pleased! These are the nicest ones formula-wise that they've done since they started making polish again! I love these. I especially like Showboat. 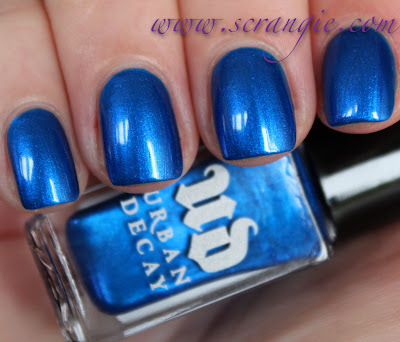 I wish UD would sell colors in a full size version and individually. 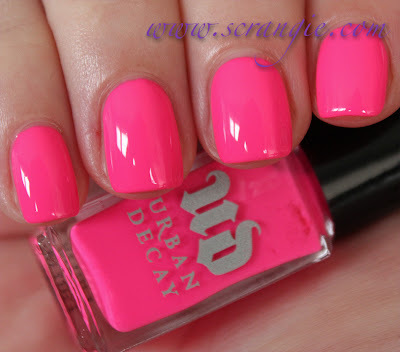 BTW, do you have any advice for photographing neon polishes? I have tried messing with so many settings on my camera and I just can't get color accurate photos...lots of time I can't even get close! Ugh, photographing neons, it's a nightmare! The one trick I've learned through experimenting over the years is to take your photos of them in the dimmest light possible. It helps the color come out without making them look too insane and washed out. Love Fishnet, wish I loved Radium as I'm a geek for all things nuclear! Ahhh, you too?! So am I!! Good to know there's someone else - you like astronomy, that's socially acceptable; you like nuclear physics, people think you're deranged! Gorgeous collection, and flawless swatches as usual! :) My favorite is Covet. It is a lovely kit a nd great photos!! i love the pinkt one. its so bright :) but also the blue one is a nice one. If I remember correctly, Radium was one of UD's core polish colors when they started and I wonder how the new shade compares to the old one. Perversion is an old shade too, but not as old as Radium. I'm also wondering how Covet compares to Misa's The Grass is Greener On My Side? I do like this set, but I really wish they'd start making some full sized polishes too. So many companies make full size bottles & mini sets of collection, I wish UD was one of them. I don't think I ever had the original Radium, but there's a vintage Urban Decay polish gallery somewhere in my blogroll that might have pictures of all of them... Going to go check! Good question on the Misa polish! It's been so long since I've worn it that I barely remember what it looks like. From memory, the shimmer was finer (Covet's shimmer is chunky/speckly) and the color may have been brighter, but my memory of it is pretty hazy! Covet looks a bit like Sally Hansen Xtreme Wear The Real Teal. What do you think? Scrangie, what topcoat did you say you used? I think you meant to put a brand name on there! Oh that makes sense! Thanks for the follow up, I'm always so curious about your "basics" like basecoat, topcoat etc. I would LOVE to see an update to your "Scrangie's Nail Care Must-Haves" post and I'm sure your other fans would agree! Similar brightness, but Covet is more green/yellow toned, Edie is more blue toned. You might be interested to know that Wet-n-Wild's Wild Shine nailcolor in Black Creme is darkest black, super glossy and coats perfectly with one coat. And it's about a buck! That's actually my very favorite black polish! I love UD nail polishes!!!!! The colors are amazing. My favorite is Seche Vite topcoat (though it's not what I'm wearing in the pictures). I always try different brands, but I just keep going back to Seche because it's the thickest (makes your nail polish look smoother) and fastest drying. If you want one that's three-free, Poshe or Orly In A Snap are good alternatives. I bought this set (based on your review- thanks!) and have used Covet, Fishnet, and Woodstock so far. 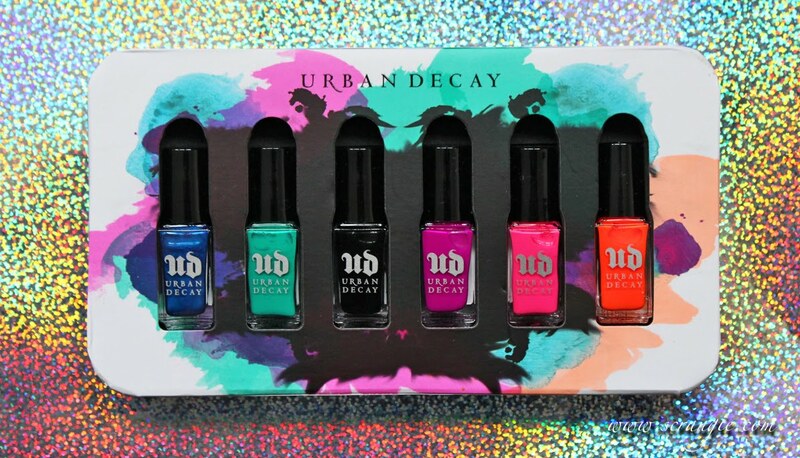 I love the colors and I think the set's a good value (I just recently started getting into nail polish so I didn't already own any colors like these, besides black), but I'm kind of disappointed by the formulas. Covet went on thin and streaky and caught in the tiniest of nail ridges (my nails are pretty smooth and I've never had this problem with any other polishes). Fishnet also seemed quite thin and runny to me. Both of those colors also started chipping immediately- like, within hours. I am pretty hard on my nails, so I don't expect days of wear, but I do like to get through one work day with my polish intact! I used basecoat and topcoat (seche vite) as usual, so I don't think it's my fault! Woodstock seems to have a better formula. I put it on my toes and it's been fine, it lasted through a barefoot badminton session over the weekend (and I LOVE how it looks with tan feet and plain flip flops!). What do you think is the closest dupe for Woodstock? It's my favourite neon pink and I'm afraid it's going to run out soon. I don't want to buy the whole set again! Thanks!